the longest European bridge ever is being built across the Oresund Strait between southern Sweden and Denmark. This is the only entry to the Baltic Sea. The question is why build a concrete monster when there is a speedy and efficient ferry service? I am only one of many Swedes and Danes appalled by this project, which threatens to jeopardise the fragile environment of the southernmost province of Skane. The fight against the bridge has been going on for years, but the authorities concerned have chosen not to listen. The bridge will inevitably lead to increasing air pollution and exploitation of the fertile lands. The very ecology of Skane is at stake. The area forms the border between the northern and southern habitats of Scandinavia and has a unique mix of species. Catches of cod in the Oresund Strait have, even prior to the bridge construction, been found with serious defects caused by the prevalence of industrial waste. Skane has the countries' most fertile lands. Now connecting highways, entry roads and terminal buildings will claim most of this precious land. One of Scandinavia's largest-ever investments in infrastructure, the Fixed Link across Oresund includes an eight-km-long bridge -- the longest in Europe -- partly built on a four-km artificial island. To top it all, a three-km-long underwater tunnel will be built. 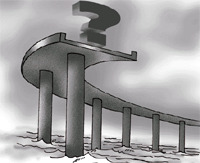 The bridge is be financed through international capital market loans guaranteed by two governments. The users motorists and railway companies -- are expected to pay to use the bridge. Truck traffic, some carrying hazardous material like poisonous gases and lethal liquids, will inevitably grow. Accidents and spills cannot be ruled out, nor can their contribution to air pollution. But then I guess this is all part of the globalisation of the world economy where environmental concerns outweigh economic profits. It is quite clear that the new bridge will pose a serious threat to diminishing fish stocks in the Baltic Sea, shared by six countries. Decreasing cod fish catches along the east coast of Sweden has already led to growing unemployment for the fisherfolk. The construction work and the bridge's many pillars will further impede currents and damage the sea-bed, thus affect the fish population. For many years the Oresund Strait has been served by a number of ferries, including train ferries and speed boats. Ferrying to Denmark is still very popular with most Swedes. Some speedboats take only 40 minutes to reach the destination. With the construction of the bridge, not only will the charm of ferrying across to Denmark be lost, but the ferry-owners will also be adversely affected. It is, therefore, strange to see the bridge being completed in less than a year despite the environmental toll that the project threatens to take. Maybe, as some critic has put it, its all a matter of a prestige. Politicians in power are anxious to leave something behind. But will it really be something people would want to remember in the future? The writer is a freelance journalist based in Stockholm, Sweden .